Fun weekend event to benefit local dog rescues. 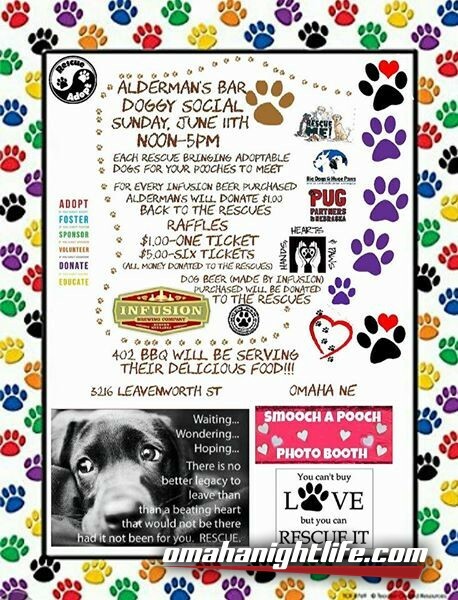 Alderman's Bar "Doggy Social" in partnership with Infusion Brewery Co. and local dog rescue groups to introduce adoptable dogs, while allowing owners to bring their own and raise money for rescues. Midtown Omaha - Sunday, June 11th- Alderman's Bar, in cooperation with Infusion Brewery Co (http://infusionbrewing.com) and the following dog rescue groups: Big Dogs, Huge Paws, Pug Parters of Nebraska, Hands Hearts and Paws and Beer Paws are featuring a first annual "Doggy Social." "This event will unite dog lovers in the midtown and surrounding areas to raise funds and find homes for wonderful pooches." Says event organizer Candy Cavanaugh. Alderman's Bar has pledged a dollar donation to the rescues for every sale of Infusion Brewing Co products. A raffle for prizes will also be held with all proceeds going to the rescues. Pools will be set up for the pooches to mingle, and Infusion Brewing Co. will also create a special non alcoholic "Doggie Brew" for sale, again, with all proceeds going to the rescues. A fun "Smooch a Pooch" photo booth will allow owners and their pets, and their new friends of course, to get a free Poloroid photo with donation. BBQ Food is available for attendees by 402BBQ (http://the402bbq.com). 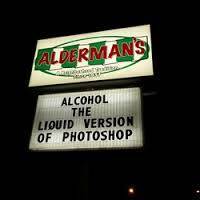 Alderman's Bar in Omaha, a neighborhood tradition since 1937.